to die intentionally or unintentionally in defense of your beliefs. "Do not misconcecpt jihad with "suicide bombings", "holywar", and "bin ladden" when there are fanatic radicals in the world misinterpreting the Koran. Further more, People of Islamic beliefs should not be targeted as a whole when a castastrophy is claimed by a jihadist in Allahs name." Its how commendable you find the act to considerate it martyrdom. I believe Allahs teachings of jihad was that of "war and battle" in defending the Koran, its beliefs, and its believers. Being a martyr indicates a person who is killed for maintaining his or her belief, knowing that this will almost certainly result in imminent death, (though without intentionally seeking death). 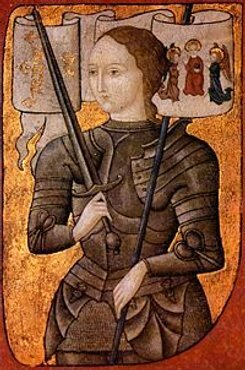 The word martyr originated at a time when many priest and or church elders and leaders were murdered due to their faith and or protecting villagers from injustices. Theres 164 jihad verses in the Koran. The Korans 164 verses on jihad does not have a passage where Jihad is explicitly defined. There are many repeated generic mentions of "strive", "fight", "struggle", and "victory" found in these verses. To strive or struggle for your beliefs and or to "commit" martyrdom for your beliefs. Jihad is an important religious duty for Muslims. A person engaged in jihad is called a mujahid, and the plural form is mujahideen. Muslims use the word in a religious context to refer to three types of struggles, an internal struggle to maintain faith, the struggle to improve the Muslim society, or the struggle in a "holy war"(Any war fought by divine command or for a primarily religious purpose). Jihad is essential for any effort to practice religion in the face of oppression and persecution. Jihad is one of the correct terms for a struggle for any cause, violent or not, religious or secular. Mahatma Gandhi's "satyagraha" struggle for Indian independence is called a jihad in Modern Standard Arabic as well as many other dialects of Arabic. The terminology is also applied to the fight for women's liberation. Muslim Indonesians define the term to mean "sacrificing one's life for the sake of Islam/God/a just cause" or "fighting against the opponents of Islam". The majority in these regions used the term to mean "duty toward God", a "divine duty", or a "worship of God", with no militaristic connotations. A wide range of opinions exist about the exact meaning of jihad as it has accrued both violent and non-violent meanings. 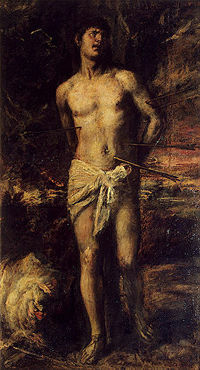 death (in battle), and some of them still are waiting..
An iconic image of Saint Sebastian displaying Martyrdom. Jose Julian Marti Perez (January 28, 1853 to May 19, 1895) was a Cuban national hero and an important figure in Cuba today. Since Jose Marti was a young boy he dedicated his life to the promotion of liberty and political independence, especially from Spain. Jose Marti was a very intelligent individual. Jose Marti was a poet, a journalist, a revolutionary philosopher, a translator, a professor, a publisher, and a political theorist. He also help fund the war of Cuban independence from Spain. 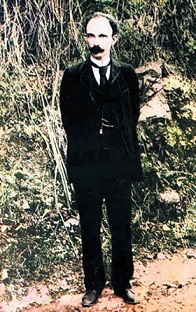 Jose Marti died a martyr in the battlefield. His murder from the Spaniards was a cry for Cuban independence from Spain. "Let those who desire a secure homeland conquer it. Let those who do not conquer it live under the whip and in exile, watched over like wild animals, cast from one country to another, concealing the death of their souls with a beggar's smile from the scorn of free men." "One revolution is still necessary: the one that will not end with the rule of its leader. It will be the revolution against revolutions, the uprising of all peaceable individuals, who will become soldiers for once so that neither they nor anyone else will ever have to be a soldier again."